The concept of “Spacetime” is not contained in Einstein’s 1905 paper on Special Relativity. Rather, it was invented during 1907 – 1908 by Hermann Minkowski (1864-1909), one of Einstein’s mentors and colleagues. Spacetime is based solely upon Lorentz’s ad hoc ether concepts of the contraction of matter and the Lorentz transformations, upon Einstein’s ad hoc concepts of Special Relativity, and upon Minkowski’s imagination and mathematics. For these reasons alone, Spacetime is ad hoc, empirically invalid and meaningless on its face. During the last century, Minkowski’s Spacetime geometry has served as an inspiration for mathematicians to direct the course of physics and as a mathematical tool to analyze, explain, expand, illustrate and attempt to confirm the various theories of relativity. A. Spacetime is ad hoc, empirically invalid and physically meaningless on its face. Like many scientists of his time, Minkowski viewed Einstein’s Special Theory merely as a generalization or elaboration of Lorentz’s April 1904 theories (Goldberg, p. 164; Dingle, 1972, pp. 167 – 169). In September 1908, Minkowski described and explained his geometrical concept of Spacetime to a gathering of German scientists. “It was a literal translation of the rigorous [relativistic] formalism that had been published earlier” by Minkowski in 1907 (Goldberg, p. 163). “The views of space and time which I wish to lay before you have sprung from the soil of experimental physics, and therein lies their strength” (Minkowski, 1908 [Dover, 1952, p. 75]). On the contrary, and as we shall soon discover, Minkowski’s geometrical views of space and time actually sprang from (and were completely based upon) Lorentz’s ad hoc physical contraction of matter hypothesis and his April 1904 treatise; upon Einstein’s ad hoc kinematic concepts of relativity, Length Contraction and Time Dilation; upon the meaningless co-variance of the empirically invalid Lorentz transformations; and upon Minkowski’s own imagination and mathematics. Therein lie their physical and empirical invalidity and their meaninglessness for physics. “[I]t is easy to see…that we should be able, by employing suitable rigid optical instruments in the laboratory, to perceive some alteration in the phenomena when the orientation with respect to the direction of the earth’s motion is changed. But all efforts directed toward this goal, in particular the famous interference experiment of Michelson, have had a negative result. To explain this failure, H. A. Lorentz set up an hypothesis, the success of which lies in this very invariance in optics for the group Gc. According to Lorentz any moving body must have undergone a contraction in the direction of its motion, and in fact with a velocity v, a contraction in the ratio. This hypothesis sounds extremely fantastical, for the contraction is not to be looked upon as a consequence of resistances in the ether, or anything of that kind, but simply as a gift from above,—as an accompanying circumstance of the circumstance of motion. “I will now show by our figure [Figures 33.1 and 33.2] that the Lorentzian hypothesis is completely equivalent to the new conception of space and time, which, indeed, makes the hypothesis much more intelligible” (Ibid, p, 81). On the contrary, as we have shown in Chapter 15, any concept of contraction of matter in the direction of motion is completely ad hoc, contrived and physically impossible. Lorentz’s physical contraction of matter was also theoretically impossible because it depends upon the existence of ether, which does not exist. Not only that, but it was totally irrelevant and unnecessary in order to explain Michelson’s null results (Chapters 9, 10, 11 and 12). Thus, when Minkowski based his concepts of Spacetime on Michelson’s null results and on the false necessity for a contraction of matter to explain such paradoxical null results, and mathematically constructed Spacetime geometry so that it would be consistent and “completely equivalent” with respect to Lorentz’s empirically false contraction hypothesis, the result was that Spacetime was based upon multiple false premises. Such false premises render the invention of Spacetime and all of its related concepts and mathematical consequences as physically invalid and empirically meaningless. Secondly, if Spacetime was premised upon Lorentz’s false concept of a contraction of matter depending upon a body’s velocity, then it must also be based upon and consistent with the empirically meaningless Lorentz transformations. Minkowski implies that this is the case because he refers to Lorentz’s 1904 concept of “local time” and to Einstein’s 1905 interpretation of it (Minkowski, 1908 [Dover, 1952, p. 82]). Minkowski also used equations with Lorentz’s and Einstein’s Lorentz transformation denominator throughout his lecture (Ibid, pp. 81, 82, 87 and 90). A non-mathematical confirmation appears when Minkowski states that “natural phenomena do not possess an invariance with the group G∞, but rather with a group Gc,” which group Gc of transformations were obtained by Minkowski during the application of his Spacetime geometry (Figure 30.1). The “invariance of natural phenomena” is just another way to describe the co-variance of physical phenomena when the Lorentz transformations are applied to them (Einstein, Relativity, pp. 47 – 48). If Spacetime is based on the ad hoc and meaningless Lorentz transformations, this is another reason why it is empirically invalid (Chapter 27). “[T]his further step is indispensable for the true understanding of the group Gc, and when it has been taken, the word relativity-postulate for the requirement of an invariance with the group Gc seems to me very feeble. Since the postulate comes to mean that only the four-dimensional world in space and time is given by phenomena, but that the projection in space and in time may still be undertaken with a certain degree of freedom, I prefer to call it the postulate of the absolute world (or briefly, the world-postulate)” (Ibid). “The validity without exception of the world-postulate, I like to think, is the true nucleus of an electromagnetic image of the world, which, discovered by Lorentz, and further revealed by Einstein, now lies open in the full light of day” (Ibid, p. 91). Since we now know that any hypothesis for the contraction of matter in the direction of velocity is completely ad hoc and meaningless (Chapter 15), that the Lorentz transformation equations are completely ad hoc and empirically invalid (Chapters 16 and 27), that the concepts of Length Contraction and Time Dilation are completely ad hoc and physically meaningless (Chapters 26 and 28), and that Einstein’s relativity postulate and his concept of co-variance are ad hoc and empirically invalid (Chapters 23, 24, 27 and 28), thus so must Spacetime and its world postulate suffer the same fate (because they are premised upon and totally consistent with the above relativistic concepts). B. 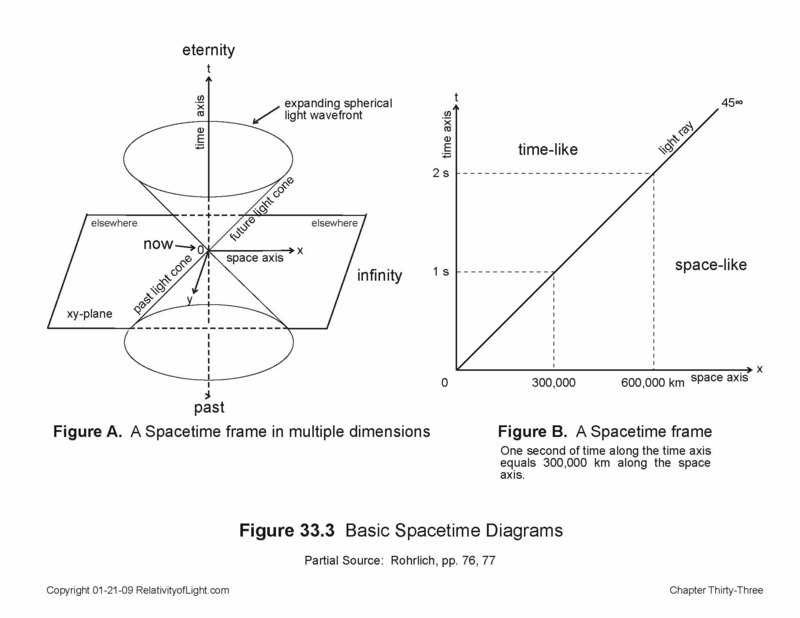 A brief description of Minkowski’s Spacetime geometry. Regardless of its empirical invalidity, the remainder of Minkowski’s lecture was structured “along a purely mathematical line of thought to arrive at changed ideas of space and time” (Minkowski, 1908 [Dover, 1952, p. 75]). In Section I of his lecture, Minkowski began with the mathematical form of Newton’s mechanics: the Galilean transformation equations. “Let x, y, z be rectangular coordinates for space, and let t denote time” (Ibid, p. 76). “A point of space at a point of time, that is, a system of values x, y, z, t, I will call a world-point. The multiplicity of all thinkable x, y, z, t systems of values we will christen the world” (Ibid). Minkowski then described this world point in motion over time from -∞ to +∞; in other words, over eternity. The changed coordinate points dx, dy, dz and dt result in a “world line” (Ibid). He also abstractly illustrated the “world” with four coordinate “world axes” and a zero coordinate point in the center (Figure 33.3B). 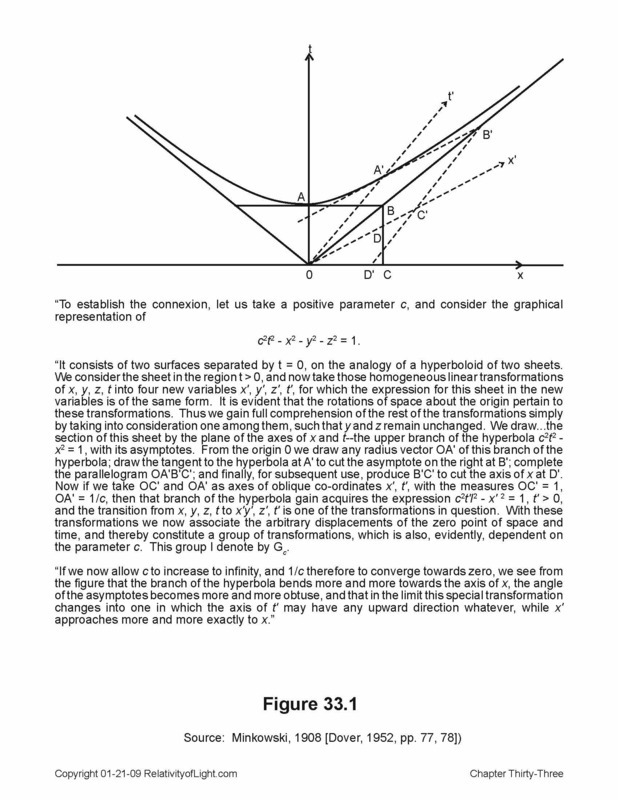 Minkowski then asserted “that we may subject the axes of [spatial coordinates] x, y, z at t = 0 to any rotation we choose about the origin, corresponding to the homogeneous linear transformations of…x2, y2, z2” (Ibid, p. 77). This means that the algebraic form of Newton’s laws of mechanics remains unaltered or invariant if we measure their spatial coordinates at any arbitrary position in any arbitrary linear direction from zero (Ibid, p. 75). But since “the zero point of time is given no part to play” in the Galilean transformation equations we have complete freedom to give “the time axis whatever direction we choose towards the upper half of the world” for any value of time greater than zero (Ibid, pp. 75, 77). Minkowski’s connection between the space axis and the time axis involved a positive parameter cand the graphic representation of c2t2 – x2 = 1. To understand how Minkowski’s geometry created a group of transformations (called Gc) which “associated the arbitrary displacements of the zero point of space and time” of any number of world points, Figure 33.1. Group Gc was the geometrical equivalent of the Lorentz transformation equations, and they resulted in the “invariance of natural laws.” Minkowski also defined the ‘value of c’ as “the velocity of the propagation of light in empty space” (Ibid, p. 79). At the end of Section I, Minkowski stated that “we have in the world no longer space, but an infinite number of spaces, analogously as there are in three dimensional space an infinite number of planes [or frames of reference]. 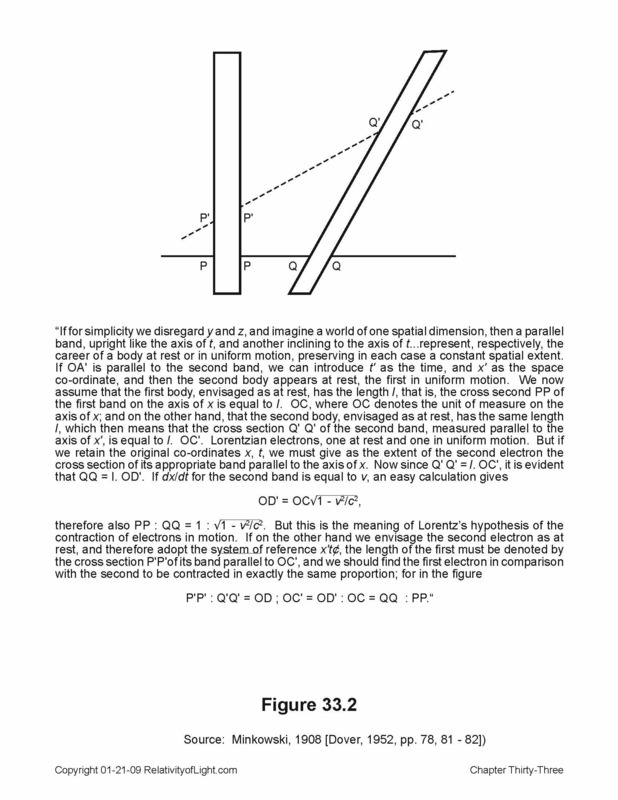 Three dimensional geometry becomes a chapter in four dimensional physics” (Ibid, pp. 79 – 80). Minkowski’s “idea was very simple: since the Lorentz transformation on which the special theory of relativity is based involves a transformation of space as well as of time one may treat time just like another dimension of space, a fourth dimension, as it were. This…idea of a four-dimensional ‘space’, three dimensions of ordinary space and one time dimension, became known as Minkowski space” (Rohrlich, p. 75). Minkowski’s new Spacetime geometry illustrated Cartesian coordinates; it used straight lines and was flat like Euclidean geometry (D’Abro, 1950, p. 196). However, we shall “see that we are not dealing with ordinary Euclidean geometry” (Born, p. 305). Spacetime has its own special nomenclature, its own conventions, its own symbols and its own mathematical expressions (Dingle, 1972, p. 176). In Section II of his lecture, Minkowski described an axiom, c2dt2 – dx2 – dy2 – dz2, which he asserted means “that any velocity v always proves less than c.” This was, of course, completely consistent with Lorentz’s April 1904 treatise and with Einstein’s Special Theory. What did Minkowski mean that the world would have an infinite number of spaces? 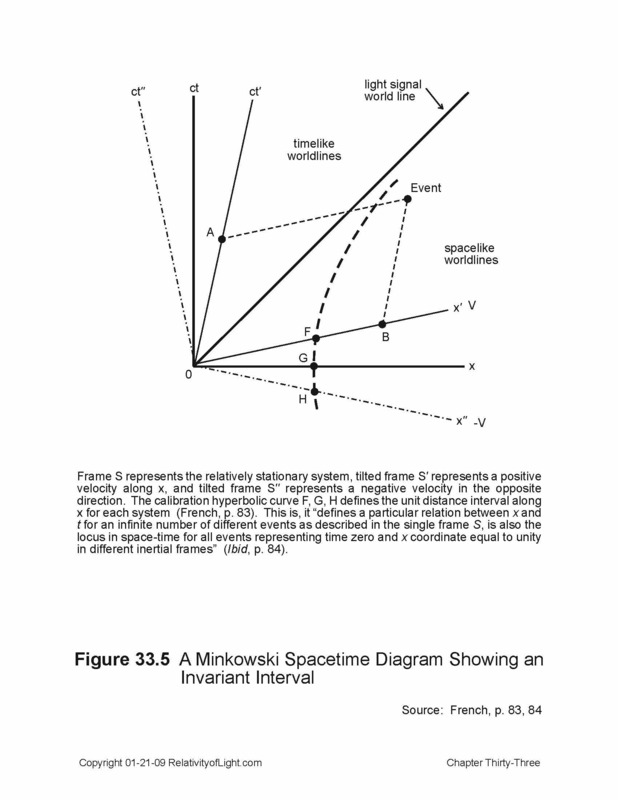 At the beginning of Section III of his lecture, Minkowski individualized space and time for each world point (i.e. each event or observer) by giving it its own set of four axes (Figure 33.3A). The 0 was the zero-point of Spacetime for each world point. 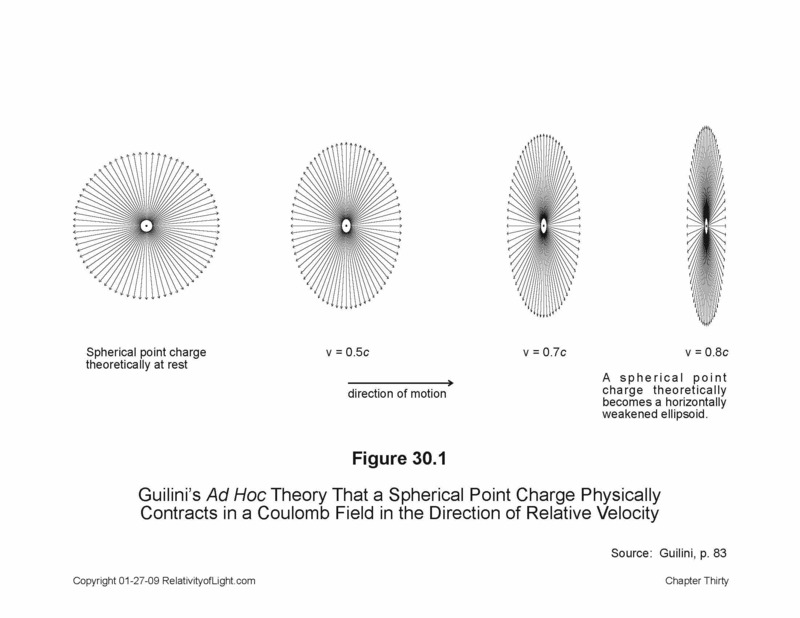 Minkowski illustrated the velocity of light at c as a straight line (a “light line”) beginning at the zero (0) point of Spacetime and continuing at a 45° angle equidistant between the x (space) axis and the t (time) axis (Figure 33.3B). If one passed this light line through a 360° rotation, the result would be a “light cone” with the vertical time axis in the center and an infinite number of x and y axes in all possible directions on an xy plane (Figure 33.3A). Again, each event (or observer) in Spacetime has its own lightcones (Rohrlich, p. 78). Since “three dimensional ordinary space…is infinite our symbolic picture of it [the xy plane is]…also infinite. But so is time” (Minkowski, 1908 [Dover, 1952, pp 83 – 84]). Thus we must also construct a light cone into the past, and we end up with a double light cone (Ibid, p. 83). Each world point had a past light cone for all other “world-points which send light to 0,” and a future light cone for all other “world-points which receive light from 0” (Minkowski, 1908 [Dover, 1952, p. 83]). Everything that goes on [in Spacetime] must be judged relative to [each] cone” (Rohrlich, p. 78). 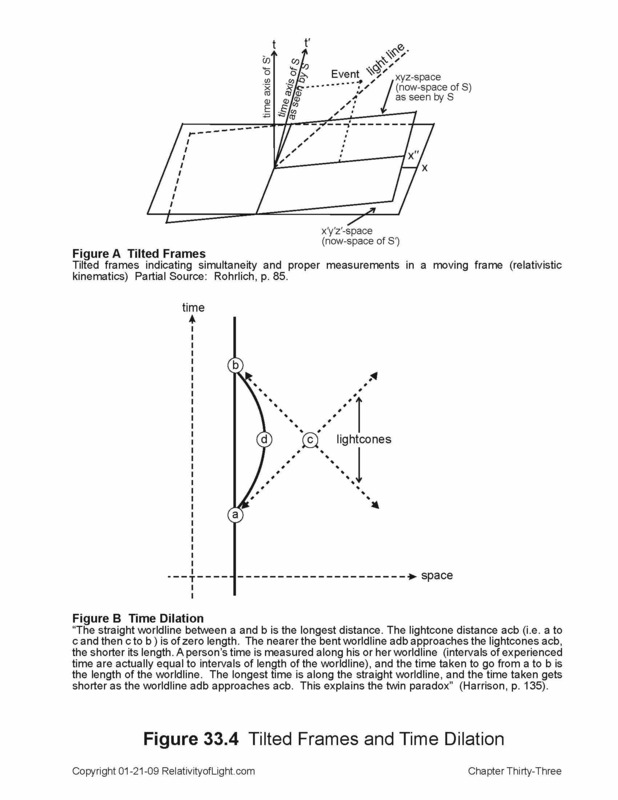 In order to graphically illustrate Einstein’s relativistic concept of relative motion and kinematics (length contraction and time dilation), Minkowski tilted both axes of the moving frame equally toward the light line. In other words, “[O]bservers in relative motion have worldlines inclined to each other” (Harrison, p. 132; Figure 33.4A). The algebraic formula which “relates the intervals of time and space of observers in relative motion at speed v…[is the] Lorentz transformations” (Ibid, p. 133). “To show that the assumption of groupGc for the laws of physics never leads to a contradiction, it is unavoidable to undertake a revision of the whole of physics on the basis of this assumption. This revision has to some extent already been successfully carried out for questions of thermodynamics and heat radiation, for electromagnetic processes, and finally, with the retention of the concept of mass, for mechanics (Minkowski, 1908 [Dover, 1952, p. 86]). …It comes out very clearly in this way, how the energy depends on the system of reference” (Ibid, p. 87). This equation (in various different algebraic forms) is now called the “spacetime interval.” Sklar asserts that “in Minkowski spacetime we do not discuss distances between events, but rather the interval between them [along a curve]. This Spacetime interval] is a number and which is an invariant property of the spacetime” (Sklar, pp. 58 – 59). Thus, very happily for Einstein, the interval between events in Spacetime is always invariant, and the interval along a light line in Minkowski’s absolute world is always zero (Figures 33.4B and 33.5). “changed the constant magnitude of the relative velocity existing between ourselves as observers and the events observed. On the other hand, here at least was an invariant magnitude ds2, representing the square of the spatial distance covered by a body in any Galilean frame, minus c2 times the square of the duration required for this performance (the duration being measured, of course, by the standard of time of the same frame). It mattered not whether we were situated in this frame or in that one; in every case, if ds2 had a definite value when referred to one frame, it still maintained the same value when referred to any other frame” (D’Abro, 1951, p. 195). This is nothing more than mathematical gibberish. The mathematical justification for Minkowski’s absolute Spacetime Interval ds2 depended inter alia upon Einstein’s relativistic concepts of kinematics, inter alia, the “Relativity of Simultaneity” and the “Relativity of Length,” and their mathematical counterparts “Time Dilation” and “Length Contraction” (Figure 33.4B). In previous chapters of this book we have explained why these ad hoc concepts are arbitrary, empirically invalid and meaningless (Chapters 26 and 28). It also depended upon Einstein’s impossible second postulate concerning the absolute propagation velocity of light at c, relative to everything, which we have also found to be empirically invalid (Chapter 21). Therefore, there is not even a valid mathematical justification for the Spacetime Interval ds2. Empirically, we also know that the time interval and the space interval for the transmission of light from one place to another, or from one star to the Earth, is not zero; rather it is ct. In the twenty-first century we can measure these real intervals with EM radiation (vis., radar, radio waves, and lasers), and we can detect and calculate such measurement data with sensors and computers. Therefore, the invariant Spacetime Interval (ds2), which has an absolute relativistic value of zero, is empirically invalid and meaningless in the real empirical world of space and time. In Section V of his lecture, Minkowski described what he called a striking advantage afforded by his world postulate; it involved “the effects proceeding from a point change in any kind of motion according to the Maxwell-Lorentz theory” (Minkowski, 1908 [Dover, 1952, p. 88]). This was, of course, a generalization of Einstein’s Special Theory which only involved inertial motion. Minkowski then proposed a new four dimensional law of attraction, which he claimed mathematically resulted in Kepler’s laws. According to Minkowski, this new law of attraction, when combined with his new mechanics (reformed in accordance with the world postulate), was just as capable of explaining astronomical observations as Newton’s laws (Ibid, p. 90). Finally, Minkowski ended his lecture with the assertion that he had just pre-established a “harmony between pure mathematics and physics” (Ibid, p. 91). Why did Minkowski feel compelled to invent Spacetime geometry, with all of its bizarre mathematical concepts, axioms, conventions and consequences? Because this was the only way he could describe a multidimensional world that was governed by the Lorentz transformations, Special Relativity and mathematics. If we discard the ad hoc Lorentz transformations and Einstein’s empirically invalid Special Theory, as we must, then the only remaining rationale for Spacetime geometry is a playground for pure mathematicians. The reciprocal of this fact is that embedded in Spacetime geometry are the Lorentz transformation equations and the mathematical consequences of Special Relativity. Therefore, any Spacetime diagram is nothing more than a graphic representation of how a phenomenon or an event should look from the distorted perspective of Special Relativity. Spacetime geometry illustrates and demonstrates the mathematical consistency of Special Relativity, and vice-versa. In other words, they are both mutually validating mathematical constructs. This ad hoc type of validation is both circular and meaningless. It is like demonstrating the validity of the Lorentz transformations with the mathematical consequences of Special Relativity, and vice-versa. The result is absolutely certain, but also worthless. Minkowski referred to Spacetime as an “independent reality” and implied that it was physically real; whereas Dingle characterized Spacetime as “metaphysics” (Dingle, 1972, p. 169). “The immediate effect…of Minkowski’s paper was mainly one of mystification; Einstein himself is reported to have said that after reading it he felt he did not understand his own theory—which is not surprising, since Minkowski’s “time” was only “eternity” and Einstein’s was only “instant” or “duration” (Dingle, 1972, p. 173). “Without it the general theory of relativity…would perhaps have got no farther than its long clothes” (Einstein, Relativity, p. 63). The reason why Einstein used Spacetime Euclidean geometry for his unnecessary and empirically invalid General Theory is because his General Relativity is in large part a theory of non-Euclidean geometry (if that statement makes any sense). He needed Spacetime, inter alia, to illustrate and explain his mathematical concepts of curved space and curved Spacetime (gravity), and his later mathematical model of a finite spherical universe (Einstein, 1917 [Dover, 1952, pp. 177 – 188). However, one should remember that all of these contrived and interdependent relativistic and mathematical theories had their origin in Einstein’s ad hoc Special Theory, and his failed attempt to justify his invalid and impossible second postulate: that the velocity of a light ray was always c for every inertial observer regardless of such observer’s linear motion toward or away from such light ray. Most of Einstein’s followers blindly accepted all of the above esoteric and amorphous mathematical theories as physically real and empirically true. The result is that Spacetime geometry, along with Special Relativity and General Relativity, are taught to students as required courses in many of the world’s universities. These ad hoc mathematical theories have almost universally become accepted as valid science. They are currently the primary foundation and justification for uncountable pure mathematical theories concerning the universe and the quantum world (for example, see Wheeler’s 1999 book, Journey Into Gravity and Spacetime). The Big Bang, singularities, the spherical universe, the expanding universe, the expansion of space, quantum mechanics, particle physics, quantum field theories, and the Superstring theories are only some of the most notable examples. They form the top of the current theoretical and relativistic house of cards. This is not physics; this is not science; it is not even science fiction…it is pseudo-science. “[S]ince Gc is mathematically more intelligible than G∞, it looks as though the thought might have struck some mathematician, fancy-free, that after all, as a matter of fact, natural phenomena do not possess an invariance with the group G∞, but rather with a group Gc, c being finite and determinate, but in ordinary units of measure, extremely great. Such a premonition would have been an extraordinary triumph for pure mathematics. Well, mathematics, though it now can display only staircase-wit, has the satisfaction of being wise after the event, and is able, thanks to its happy antecedents, with its senses sharpened by an unhampered outlook to far horizons, to grasp forthwith the far-reaching consequences of such a metamorphosis of our concept of nature” (Minkowski, 1908 [Dover, 1952, p. 79]). “[T]he process of allowing mathematics to direct physics, which began with Maxwell…had now reached a point at which it is taken as the proper function of mathematics to order physics along the path which mathematics points out, and mathematics is chided for neglecting this duty and allowing physics to choose its own way. The return to medieval scholasticism, against which the protest of Bacon and the other pioneers of modern science was thought to have been finally successful, was now complete. With Minkowski’s work physics had escaped from experiment and been captured by mathematicians” (Ibid, pp. 170 – 171). “[Spacetime] contributed perhaps more than any other single factor to the transformation of mathematics from the servant into the master of physics, and introduced more false ideas into the subject—pre-eminently the totally irrelevant idea of time (eternity)—than anything else. It is to Minkowski that we owe the idea of a “space-time” as an objective reality—which is perhaps the chief agent in the transformation of the whole subject from the ground of intelligible physics into the heaven (or hell) of metaphysics, where it has become, instead of an object for intelligent inquiry, an idol to be blindly worshipped” (Dingle, 1972, p. 169). “The validity without exception of the world-postulate, I like to think, is the true nucleus of an electromagnetic image of the world, which, discovered by Lorentz, and further revealed by Einstein, now lies open in the full light of day” (Minkowski, 1908 [Dover, 1952, p. 91]). Needless to say, Minkowski’s ad hoc Spacetime geometry is empirically meaningless and must be discarded by everyone (other than pure mathematicians) before it can cause more mischief for physics.